On Nov. 25, 2008, Dylan Robert Hall was born in Savannah, Georgia. Despite a healthy body throughout his mom’s pregnancy, Dylan suffered meconium aspiration along with two other bacterial infections during delivery. The doctors weren’t sure he’d survive his first night. On Thanksgiving Day, two days after his birth, Dylan had shown enough improvement so that mom and dad could hold their baby boy for the first time. As the days went on, ‘Dyl Pickle’ proved to be a strong healthy baby that just happened to be born very sick. During the two weeks Dylan spent in the hospital, the Hall family discovered how lucky they were to live in Savannah where the level of care their baby required was just down the street. Many of the families had to drive long distances to visit their children in the Neonatal Intensive Care Nursery. This is where the Ronald McDonald House® comes in. Established in 1987, the Savannah Ronald McDonald House has provided a “Home away from home” for more than 5,000 families. The House has 13 bedrooms with private baths, a communal living room and kitchen, dining and laundry areas. Each night volunteers from the community provide a home-cooked meal for the families to share. To celebrate Dylan’s 8th birthday, the Huc-a-poos and Hall families would like to invite you to participate in the 8th annual Pickle Run to support our local Ronald McDonald House Charities of the Coastal Empire! This 5k beach & road run (or walk) will start at 8:30 am on Saturday, Nov. 26, 2016 at Huc-A-Poos, located at 1213 E. Highway 80 on Tybee Island. All proceeds benefit our local Ronald McDonald House Charities of the Coastal Empire. There will be a celebration following the walk at Huc-A-Poos featuring prizes, raffle and pizza. Early registration is $25; day of registration is $30. This includes event t-shirt*, 1 raffle ticket and HUC-A-POO’S breakfast pizza. 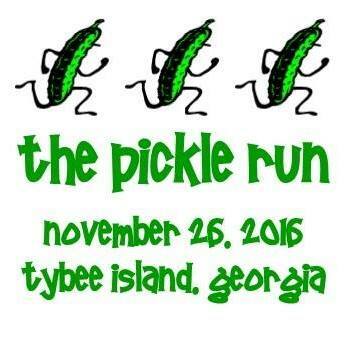 For more information about the Pickle Run, go to active.com. *T-shirt is guaranteed for registration received by Nov. 17, all others are while supplies last.